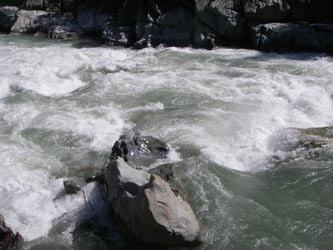 The North Fork of the American River is a free-flowing run, which means upstream dams don’t control its flows. In addition, the drainage that feeds this river is fairly small and low in elevation. This means that the North Fork has a short window of time during which it has enough water for recreational boating. The spring snowmelt typically begins in April and is finished by May. Commercial rafters should call an outfitter early in the season to find out when trips are available, and private kayakers and rafters should be sure to look up flows before making plans for a trip. When it rains, it flows. When it snows…go skiing! Typically, when the rain hits California, the North Fork American rises. However, when the snow level drops to 2,500-4,000 feet, the North Fork is usually low. In the spring, when the snow melts, it runs more consistently.